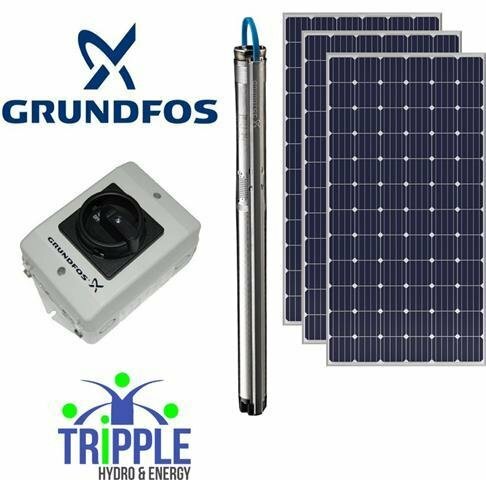 The High performance submersible DC/AC Grundfos solar pump combo is ideal for off-grid applications. The wide voltage range enables the motor to operate at any voltage from 30-300 VDC or 90-240 VAC. This makes installation and sizing very easy. The built-in electronic unit gives the SQFlex system a number of advantages compared to conventional products. One of these advantages is the built-in microprocessor with MPPT. Thanks to the MPPT function, the pump's duty point is continuously optimised according to the input power available. MPPT is only available for pumps connected to DC supply. The flow levels on the Grundfos SQ Flex pump range is flexible dependent the well depth and panel configuration. PV combination could range from 1 panel up to 14 depending the voltage and Amp ratings of the panels used. The Grundfos SQ Flex range have been well tested and trailed with the Renewsys A Grade (Poly)Multi Crystalline Panels ranging from 265W to 325W. Please make use of our well experienced team to assist with your design and suggested panel configurations for your project. For assistance please complete the pump sizing information to assist with your specifications. Renewable Water Harvesting & Pumping Solutions. We offer high quality products at affordable prices with backup and after service support. Our products carry an excellent warranty for customer peace of mind. Our main focus is DIY solutions! We have workshops available in most of the provinces should there be any repairs needed in RSA on most of our products. Our products and services are available at very competitive prices! Most of our purchases are online which means we don't have retail outlet expenses like many of our competitors. Most of our products carry a 2 year manufacturer warranty for customer peace of mind. As a pumping solutions specialist company we offer assistance with solutions design in various fields. Our product lines are available for domestic, commercial and industrial applications. Superior service and prices. 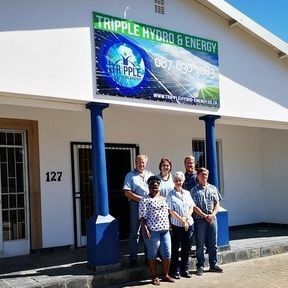 Tripple Hydro & Energy really out-performs their competition with amazing service and after sales support. Well done! Tripple Hydro & Energy - Suppliers of High Quality - Pumps, Solar Pumps, Renewable Energy Solutions & Water Harvesting Systems, mainly focused on the DIY market. Our prices are very competitive and believe that we will build a very loyal customer base due to our product offering and pricing.